LH-700, Other Acoustic Guitar from The Loar. 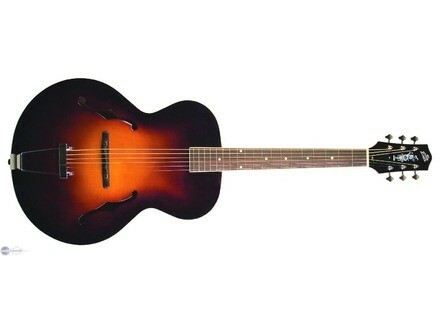 The Loar released the LH-700 an archtop guitar finished with nitrocellulose lacquer. The guitar is designed to be suited for jazz soloing or accompaniment. The LH-700 is assembled with a solid spruce top and flamed maple back, sides and neck. The bone nut and compensated adjustable ebony bridge is designed to let the sound of the select tonewoods resonate clearly, and the fretboard are made of bound ebony. The archtop is finished with an inlaid "Flowerpot" headstock design and a nitrocellulose lacquer tobacco sunburst finish. The LH-700 will only be built in very limited quantities. It comes standard with the Golden Age-styled Deluxe Vintage Hardshell archtop case. For more info on The Loar's products, check out: www.theloar.com. Recording King Unveils Gospel Songstress Recording King introduced the Gospel Songstress acoustic guitar. JG-608 Acoustic Guitar By Johnson The spruce top Johnson JG-608 acoustic is designed to offer a combination of quality for entry-level players. Godin To Unveil New Models At Anaheim Godin Guitars will officially unveil further models at NAMM 2009.